The Grasshopper Styles are those VisualARQ object styles created from Grasshopper definitions. You need to have Grasshopper installed. 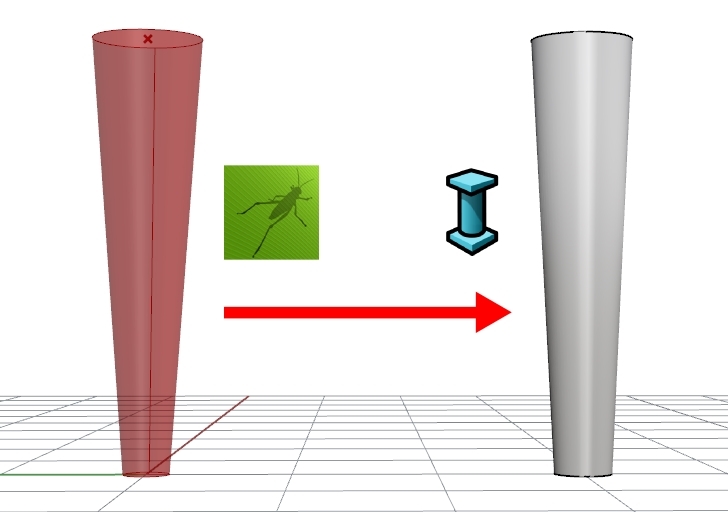 In the example below we will create a parametric “Column style” from a Grasshopper definition. Type Grasshopper in the Rhino Command line to launch Grasshopper. Output params are those components that will be read by VisualARQ as the different parts (components) of an object style. Geometry Param(Params > Geometry > Geometry): Component for geometric elements. Text Param (Params > Geometry > Text): Component for Text elements. Hatch Param (Params > Geometry > Hatch): Component for Hatch elements. The Grasshopper styles are created and managed from the Style Properties dialog for each one of the following objects: Beam, Column, Window, Door, Opening, Stair, Railing, Slab, Roof, Furniture, Element and Annotation. Assuming the Grasshopper definition (.gh file) is already done, open the object styles dialog of the desired object type: vaColumnStyles. Click on the New… button and select the Grasshopper style option. The Grasshopper Style wizard will appear. 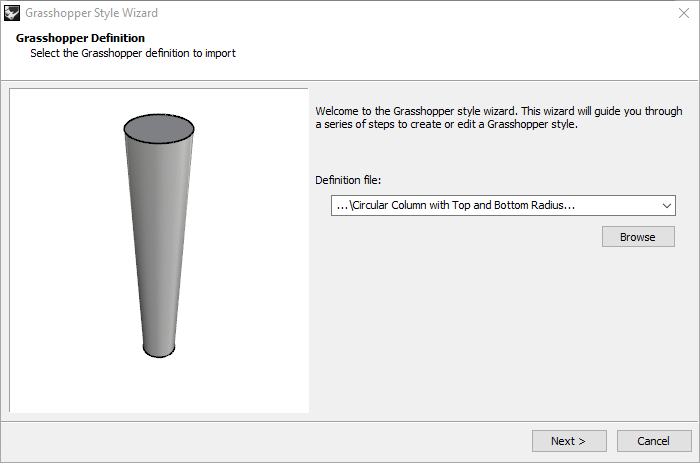 This wizard will guide you through the steps to define the Grasshopper style parameters. The left side of the wizard shows a preview of the object style generated as soon as the required information is completed. Click on the Browse button to select the .gh file created before. Insert point, path or profile curves (read below). Depending on the object type and the input parameters, this step may require to specify the point or curve detected in the definition to perform as the object insert point, the object path curve, or the object profile. Insert point: for the Column, Furniture, Element and Annotation objects. 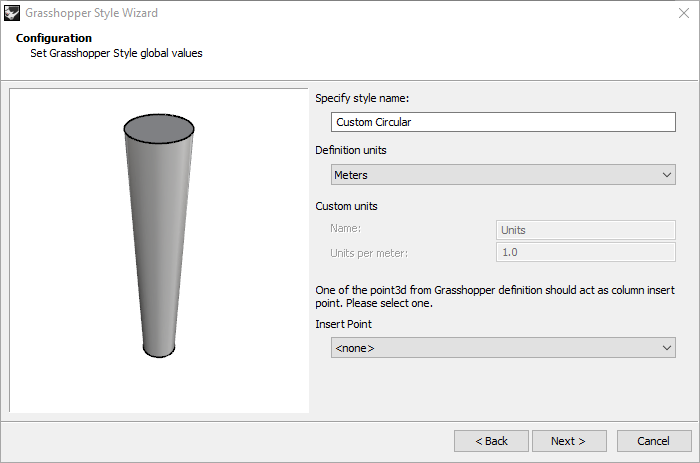 If the None option is selected, the insert point of the object is referenced from the Origin coordinates (0,0,0) in the Grasshopper definition. Path curve: for the Beam and Railing objects. Profile: for the Window, Door and Opening objects. When the Auto option is selected, the bounding box of the dynamic block will perform as the cutting volume when this object is inserted in a wall. 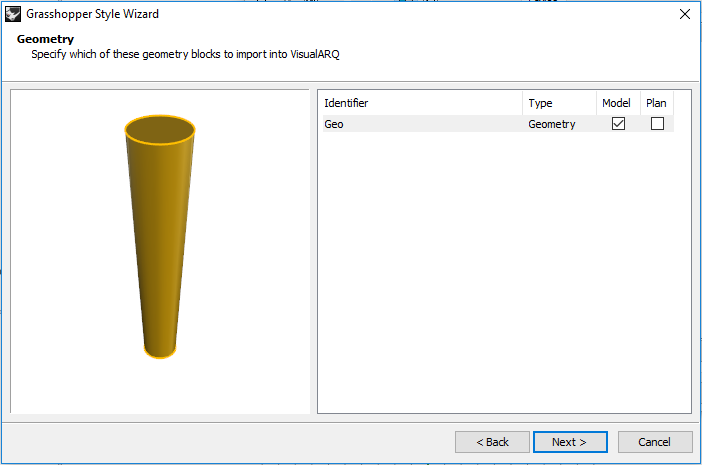 Specify which of the geometry blocks to import into VisualARQ. The names of these Geometry blocks are taken from the name of the output components params in the Grasshopper definition, and they can be edited in this step if desired. Model: object representation in 3D. Plan: object representation in plan views when the Cut Plane of the level where the object is situated is enabled. Note 1: When all components are assigned to the Model representation, the 2D representation will be taken from the real section of the object according to the level cut plane height where the object is situated. 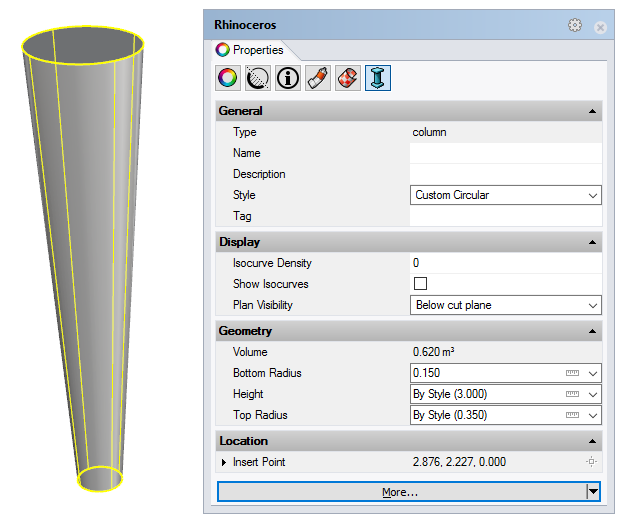 Note 2: When all components are assigned to the Plan representation, the object will hide from 3D views. 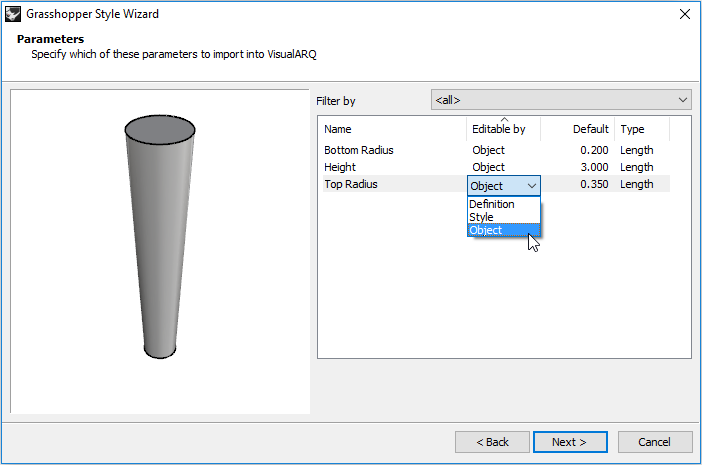 Definition: the parameter will be hidden in the VisualARQ style and properties dialogs. Object: the parameter can be edited separately for each element with that style in the model. However, parameters editable “by object” can also take the value defined “by style”. Style: the parameter can be edited by style, so the changes will apply to all elements with that style. Default: shows the default value. Unreferenced geometry will show up in red color. You will need to click on the button and pick the object in Rhino before moving forward. In case of a value list or a boolean toggle, a dropdown list with the corresponding options will be available. Number: any floating point number that doesn’t fit in any of the following types. Length, Area and Volume: the value will be converted to the units of the document. Angle: the value will change from radians to degrees. Percentage: the value will be 100 times the one specified in the Grasshopper defintion. 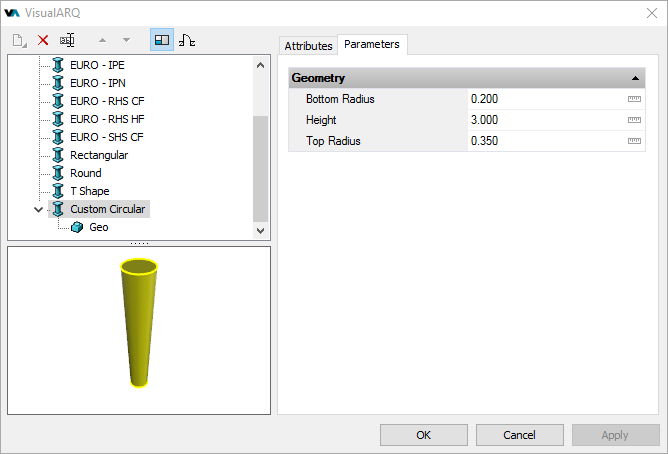 The list of parameters displayed can be filtered by groups, in case they are located inside groups in the Grasshopper definition. You can change the Editable by and Type settings at once from a multiple selection of parameters. Once the grasshopper style wizard is completed, the new style will appear in the object styles list. To edit the style again, right-click on the style name to open the context menu and select Edit. This operation will open the Grasshopper style wizard again. Panel, as any other regular VisualARQ object). Only those input parameters editable “by Object” will appear in the Properties panel.